Reading and share top 5 famous quotes and sayings about Midwives by famous authors and people. Browse top 5 famous quotes and sayings about Midwives by most favorite authors. 1. "Journeys are the midwives of thought. Few places are more conducive to internal conversations than moving planes, ships or trains." 2. "Midwives do not fear life." 3. 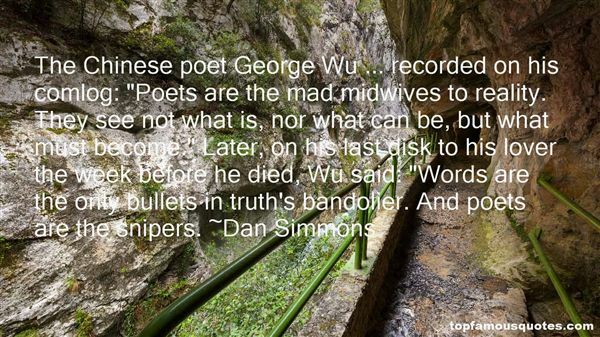 "The Chinese poet George Wu ... recorded on his comlog: "Poets are the mad midwives to reality. They see not what is, nor what can be, but what must become." Later, on his last disk to his lover the week before he died, Wu said: "Words are the only bullets in truth's bandolier. And poets are the snipers." 4. "If birth matters, midwives matter. 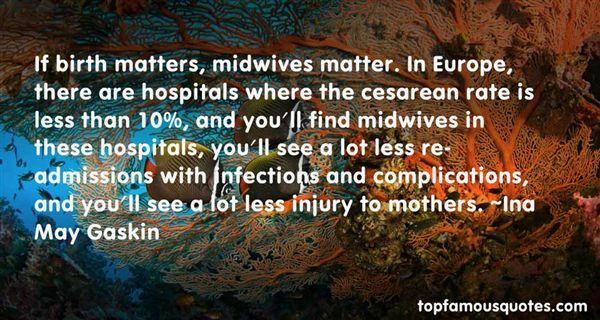 In Europe, there are hospitals where the cesarean rate is less than 10%, and you'll find midwives in these hospitals, you'll see a lot less re-admissions with infections and complications, and you'll see a lot less injury to mothers." 5. "It would be a mistake, though, to consider care by family doctors or midwives inferior to that offered by obstetricians simply on the grounds that obstetricians need not refer care to a family physician or midwife if no complications develop during a course of labor." But when you know for sure that your separate ego is a fiction, you actually feel yourself as the whole process and pattern of life. Experience and experiencer become one experiencing, known and knower one knowing."